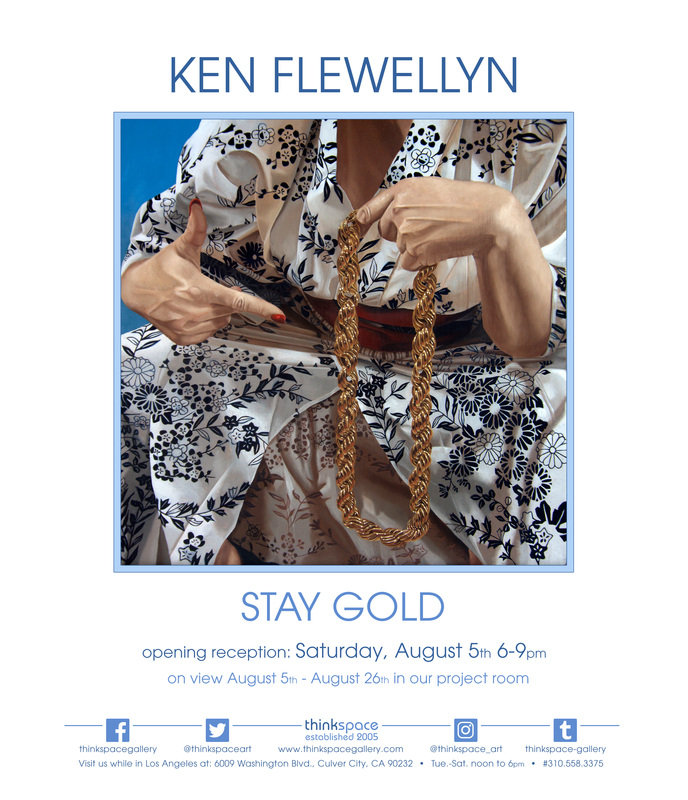 On view in the Thinkspace project room is Stay Gold, featuring new works by Los Angeles- based artist, and Thinkspace family veteran, Ken Flewellyn. 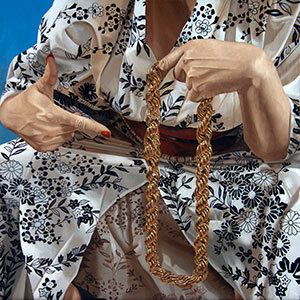 A realist painter fascinated by the intersection of diverse cultures, personal histories, and Hip Hop, Flewellyn creates portraits of women that challenge our assumptions about identity and cultural homogeneity. The juxtaposition of formal cultural garb and pop cultural accoutrements keeps the work fascinating. These tightly cropped compositions are always informed by the presence of Hip Hop imagery, whether in the form of boom boxes, tapes, gold chains or typography. Playful and energized with tactility and detail, they’re both sensual and contemporary – solemn and light. Each painting in Stay Gold is adorned with the sumptuousness of gold and includes hidden Hip Hop references to its golden age throughout, all as an ode to the genre that has never lost its sheen.